In response to multiple requests, we have created a full online Security+ course. 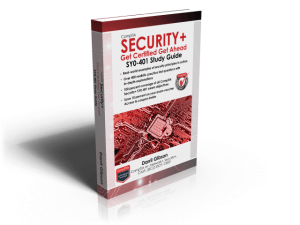 This course includes the full text of the top selling CompTIA Security+: Get Certified Get Ahead: SY0-401 Study Guide packaged within an online Security+ course. Random practice tests from the all of the practice test questions in the CompTIA Security+: Get Certified Get Ahead: SY0-401 Study Guide. All questions include explanations so you’ll know why the correct answers are correct, and why the incorrect answers are incorrect. Two new sets of performance-based questions with a total of 22 questions. These new questions use a new testing engine that includes realistic drag and drop, matching, sorting, and fill in the blank questions. See a demo here. This online Security+ Course is just a few clicks away.